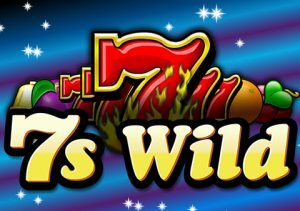 One of Canada’s most popular brick and mortar casino games, 7s Wild, has been given the online video slots treatment by IGT. It’s a super simple 5 reel, 5 payline game that comes with win both ways payouts and a free spins round where the top paying lucky 7 symbols turns into a wild. Play on your desktop, tablet or mobile from between 5p and £150 per spin. IGT has kept things really basic here, both in terms of design and gameplay. The plain white reels contain just 5 different fruity symbols. You’ll see cherries which pay 20 times your bet if you land 5 on a line. They’re joined by oranges which pay up to 30 times your bet, plums which award up to 50 times your bet and bells which award up to 100 times your bet. The most lucrative symbol is the lucky red 7. This pays 4, 20 or 200 times your bet if you land 3, 4 or 5 across a payline. The win both ways game engine means that winning combinations can start from the right most reel as well as from the usual reel 1. There’s only one feature in 7s Wild – the Free Spins Bonus feature. Unusually, it’s not triggered by scatters (there aren’t any of those). Instead, you’ll be awarded 5 free spins if you land 5 of the lucky red 7 on the same spin. During those free spins, the lucky 7 becomes a wild and substitutes for all other symbols. That’s your lot as far as features go. You can’t even land a retrigger. This isn’t a particularly volatile game. The variance is in the low to medium range so don’t expect too much in the way of big swings. IGT has kept things really simple here. The visuals are nice and clear but nothing better than that. The gameplay is stripped back too. This game has a pretty big reputation but we’re struggling to see what all the fuss is about. It’s a perfectly solid fruit machine re-boot. That’s fine as it goes. If you’re expecting anything more than that then you’re likely to be a little underwhelmed by 7s Wild. It does offer wins of 1,415 times your bet on each spin but that isn’t enough in my opinion – I prefer bonus features and video slots like ELK Studios’ Lake’s Five and Thunderkick’s Wild Heist at Peacock Manor offer plenty as well as bigger win potential.